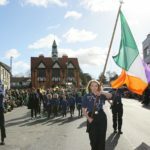 On Tuesday, March 26th at 7 pm the St. Patrick's Day Bray Parade prize giving ceremony took place at the Town Hall. 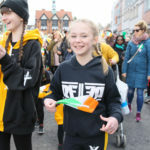 Over 50 groups with over 2,000 participants took part in the St. Patrick's Day Bray Parade. 6 awards for the St. Patrick's Day Parade to present tonight. This year The Lawless Dance Academy celebrated their 4th birthday. They are community-based and have their studio on the Dargle road. They have just reached over 100 dancers and have some Dublin Leinster and all Ireland champions in their academy. They put on a great show on St Patrick's day and impressed the judges at the reviewing stand. As a result, they were awarded the Best Community award.